The people of Afghanistan are paying a horrible price for the protracted U.S. occupation. In October, America’s war in Afghanistan will turn 17. At that point, it will be old enough to go and fight in itself—and there is no end in sight. The United States escalated the war in 2018 by increasing the number of its troops and airstrikes, and this year is bringing a record-high number of civilian deaths. Afghanistan has the worst rate of infant mortality in the world and ranks 175 out of 186 countries on the Human Development Index. Millions of Afghans live in severe poverty, unemployment is high, 41 percent of Afghan children under the age of five are stunted and 33 percent of the population is food insecure. While the U.S-led efforts to pacify the country have often been rationalized on the grounds that they will supposedly lead to the emancipation of Afghan women, just 8.8 percent of adult women have reached secondary school (compared to 35.4 percent of men), and the Afghan government—which the United States is fighting to keep in power—is ignoring violence against women. Torture under that government is widespread and on the rise, with a quarter of the victims under the age of 18. These are the conditions that prevail under U.S occupation. Deadly U.S. bombings continue to the present. Less than two weeks ago, a U.S. bombing killed 14 Afghan civilians, three of them children, in Kunduz. That’s not an exhaustive list of U.S crimes in Afghanistan, but as long as the United States and its partners are bombing Afghanistan, more horrors can be expected. The United Nations finds that anti-government elements such as the Taliban and daesh (the so-called “Islamic State”) are behind the majority of the attacks that have killed civilians so far in 2018. But it also notes “a sharp increase in civilian casualties” from airstrikes carried out by pro-government forces, a coalition in which America is a central player, with 1,047 civilians killed by this side of the war thus far in 2018. There’s good reason to believe that the U.S-led coalition is responsible for a greater portion of the civilian deaths than the UN report suggest. Civilian casualty tracking in Afghanistan, conducted by the U.S. and Afghan governments, is grossly inadequate—hardly a surprise given that the perpetrators are in charge of determining their own guilt. The United States and its partners also share blame for Afghan civilian deaths caused by anti-government forces. According to the International Military Tribunal at Nuremberg conducted after World War II, a war of aggression is “the supreme international crime differing only from other war crimes in that it contains within itself the accumulated evil of the whole.” What this means is that whoever starts a war is responsible for all the atrocities that occur in that war. The 2001 U.S-led invasion of Afghanistan was a war of aggression. The attack was not authorized by the United Nations, which means it was illegal. Nor is the argument that the United States had to invade because of the September 11, 2001 massacre tenable. In the early days of the U.S. bombing of Afghanistan, the Afghan government offered to discuss turning over Osama bin Laden if the United States stopped its airstrikes. But the Bush administration called this “non-negotiable,” opting to wage more war and to replace the oppressive, misogynistic Taliban with the Northern Alliance, an outfit, in the words of Robert Fisk, wrought with “gangsters,” and “well-known rapists and murders” of Afghan civilians. That the United States and its partners are culpable for “the accumulated evil of the whole” in Afghanistan is even clearer in view of the longer-term history. America’s assault on the country did not really begin in 2001. As the journalist Robert Dreyfuss shows in Devil’s Game, it dates to the early 1970s when the United States and its partners—particularly Pakistan and Saudi Arabia—conspired to handcuff Afghanistan’s progressives, nationalists and leftists—all of whom were strong at the time. These policies undermined Afghanistan’s hopes for a democratic society, never mind one with any degree of socio-economic equality. The U.S-led alliance’s policy reached its apotheosis later that decade when it empowered an insurgency of violent arch-reactionaries, unleashing a devastating war and the emergence of the U.S-backed Taliban government in the 1990s. 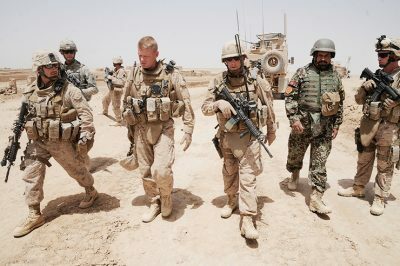 To understand America’s nearly 50 years of violent intervention in Afghanistan, it is necessary to evaluate the efforts of the U.S. ruling class to secure political and economic primacy, a process that necessary includes keeping potential challengers at bay. Afghanistan is rich with natural gas, and Afghanistan has oil reserves that in 2010 were discovered to be substantially larger than previously thought. Afghanistan has an estimated $1 to $3 trillion in mineral wealth that the Trump administration has ogled. This includes gold, copper, iron, mercury, lead, uranium, chromium, lithium and an array of rare metals, resources that are used in cell phones, computers and military goods. Afghanistan shared a border with the Soviet Union and shares one with China, a competitor of the U.S ruling class, and another with Iran, at present one of U.S. elites’ most hated adversaries. The value of this real estate is laid bare by Chinese and Iranian infrastructure projects in Afghanistan—in addition to those of India—which are crucial for determining the trade routes that will be required to export Afghanistan’s resources. As Adam Hanieh of the University of London points out, the Afghanistan-Pakistan region is at the intersection of the Gulf and Central Asia, forming “the crossroads of these two energy-rich areas.” This may go a long way to explaining the military bases the United States has constructed in Afghanistan, some of which are massive, suggesting America may be intending to stay in the country and use it as a launching pad for attacks within and possibly beyond Afghanistan’s borders. These are among “the accumulated evil of the whole” wrought by America’s war on Afghanistan. After nearly a half century, the jury is in: Afghanistan will not be safe or free under U.S tutelage. It’s time for the war to end and a central requirement of that is that America get out. Greg Shupak writes fiction, non-fiction and book reviews. He teaches Media Studies at the University of Guelph. Featured image is from New Eastern Outlook.